Find 7 differences between the images with Nutty Boy (O MeninoMaluquinho). Use your finger and touch the right spots to tellwhere each error is!There are errors hidden within these crazydrawings. Can you spot them? 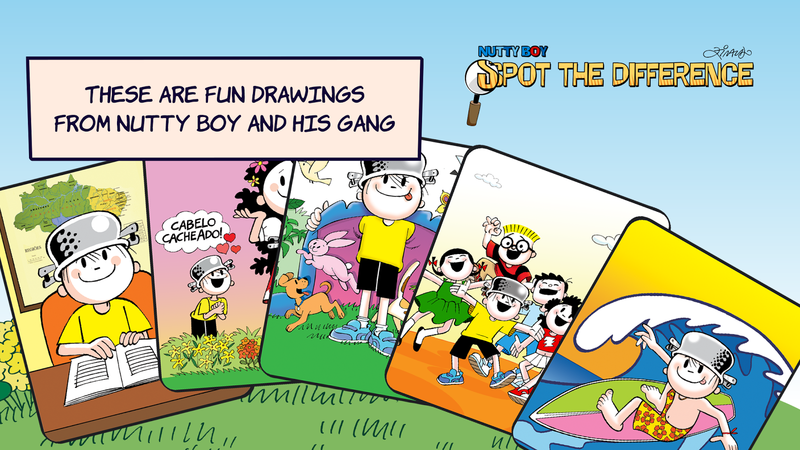 These are fun drawings from Nutty Boyand his gang for you to play in 3 different modes. You can evenplay together with your friends to find out who has the sharpesteye!Free drawing packs available – with more ondemand.MultiplayerPlay with a friend! 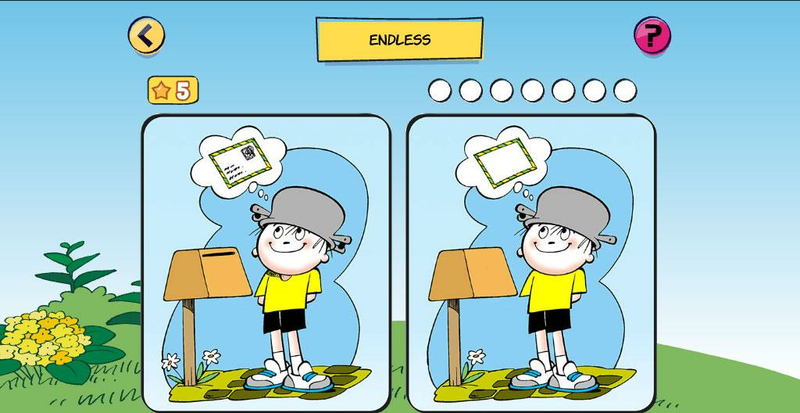 Each player should be at adifferent side of your tablet – whoever finds more error first isthe winner!EndlessFind the 7 differences without a time limit. Youstill have 5 hints!Quick ModeJust 1 minute to find all 7differences. 5 hints included! Bitstagram is a tribute to video games history. With just onetouch, you can turn your photos into instant retro video gamingclassics.From Pong’s black and white feel, to 8-bit color palletsas the Master System and the 256 glorious SNES colors - just toname a few. Explore all the possibilities and easily share them onFacebook, Instagram or Twitter.16 unique filters bringing back thekey consoles from video game history:PONG Atari Odyssey Zx SpectrumCommodore 64 Apple II (verde) Apple II NES Sega Master System GameBoy Game Boy Camera Game Boy Color Game Gear Amiga Mega Drive SuperNES* Bitstagram is not affiliated to any console manufacturer,being designed as a homage to their importance in video gamehistory. 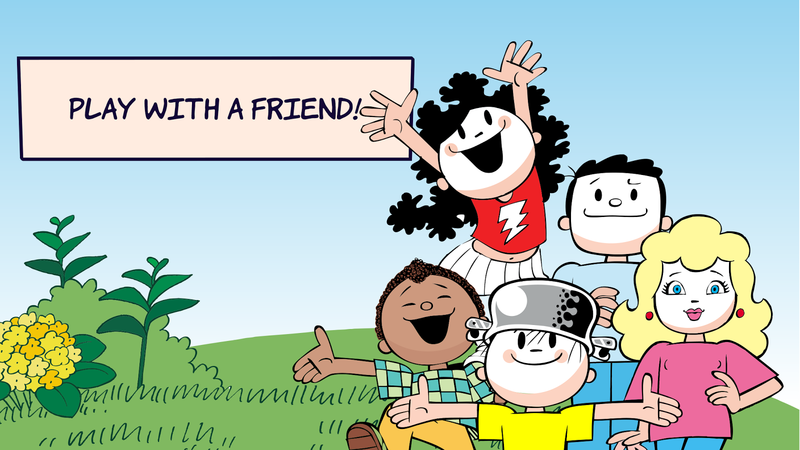 **FREE**In the Coloring with Bob Zoom app you will have lots of funwith many drawings as you color them with pencils, crayons andpaint!The animated stamps are also there – and you can even take aphoto of yourself to color over! As you finish, your drawings arestored in your own art gallery.Features:- 90 drawings and allfunctionalities available for tons of fun.- 3 types of material tocolor with: pencil, crayons and paint, with 9 colors each- 16animated stamps to give your drawings that extra touch!- You canpaint over a photo, taken on the app or chosen from your device-Original score from the series to enjoy as you paint. Vem colorir com o Menino Maluquinho! O clássico personagem infantildo escritor Ziraldo.Totalmente grátis!- 100 desenhos para pintar àvontade- 3 tipos de material: tinta, lápis e giz de cera- muitascores para você combinar- carimbos mágicos animados paraincrementar o desenho- você pode ainda escolher uma foto ou tiraruma foto nova e pintar por cima!Inventar é se divertir! Depoistodos os desenhos ficam guardados numa galeria de arte só sua, bemmaluquinha pra você.Baixe agora e libere a imaginação!Come coloringwith Nutty Boy! The classic children's character Ziraldowriter.Totally free!- 100 drawings to paint at will- 3 types ofmaterials: ink, pencil and crayons- Many colors to match- Animatedmagic stamps to enhance the design- You can even choose a photo ortake a new picture and paint over!Inventing is to have fun! Afterall drawings are stored in an art gallery just her and little crazyfor you.Download now and release your imagination! Toda gestante espera ansiosamente a hora de fazer as compras deenxoval. Mas o que é preciso ter? O que é exagero? Qual carrinhodevo comprar? E qual a quantidade de cada roupinha?Respondendoalgumas perguntas, você cria uma lista de enxoval personalizadapara o seu bebê de acordo com o seu estilo, preferências e data denascimento do seu bebê!- Obtenha uma lista com todos os itenscuidadosamente selecionados e com a quantidade necessária para oenxoval perfeito.- Marque a quantidade de itens que você já comproupor tamanho e controle facilmente o que ainda falta comprar- Tudoseparado em categorias: Enxoval do bebê, Enxoval da mamãe,Banheiro, Eletrônicos, Higiene, Passeio, Alimentação, Brinquedos,Quarto e Segurança- Inclui roupas para até 1 ano- Compre itenscertos de acordo com a estação do ano do nascimento do bebê- Dicasimportantes para ajudar você a economizar dinheiro e não fazercompras desnecessárias- Aproveite os cupons de descontos dos nossosparceiros!O aplicativo vem com uma lista inicial gratuita e vocêpode desbloquear para ter acesso à lista completa e mais de 200itens incluindo o tipo de carrinho certo para seu estilo devida.Vai viajar para os EUA? Todos os itens tem a sua tradução eminglês para facilitar a busca nas lojas. Listamos também asprincipais lojas para você fazer o seu enxoval em Miami, Orlando eNova York.Every pregnant woman eagerly awaits the time to do thetrousseau shopping. But what you need to have? What is excessive?What cart should I buy? And how much of each outfit?Answering a fewquestions, you create a layette list customized for your babyaccording to your style, preferences and date of birth of yourbaby!- Get a list of all the items carefully selected and with theamount needed for the perfect outfit.- Check the amount of itemsyou already bought by size and easily control what remains buy- Allseparate categories: Baby Layette, Mom's trousseau, Bathroom,Electronics, Hygiene, Pavement, Food, Toys, Room and Security-Includes clothing for 1 year- Buy some items according to thebaby's birth season- Important Tips to help you save money and notmaking unnecessary purchases- Take advantage of coupons fordiscounts of our partners!The application comes with a free initiallist and you can unlock to access the full list and more than 200items including the type of right cart for your lifestyle.Willtravel to the US? All items has its English translation tofacilitate the search in stores. also listed the main shops for youto make your trousseau in Miami, Orlando and New York. Try our find the differences 300 levels and enjoy beautiful imagesin a classic puzzle game, training and relaxing your brain forhours and hours. It's quite similar to the hidden object game.Characteristics: • Up to 300 levels ! • No time limit ! • Alllevels unlocked • 3 free hints per level • Designed for smartphonesand tablets • Great zoom system to help on the search • Amazing HDpictures • On/Off music and sounds (relaxing and beauiful music) •Very easy interface in many different languages • Excellentsave/load system for differences found in non-completed levels Tryour free game find the differences 300 levels, a very exciting andclassic game know as "Spot the differences", "Find thedifferences", "Game Differences", or "Spot it" where you have tofind and spot five hidden differences between two similar pictures.Remember that you have no time limit and you have three hints perlevel for a completely relaxing game. Play and have fun with this classic game of seven errors.The set of7 errors (set of seven errors) is easy and quite challenging. Youneed to compare the images and find the differences betweenthem.compare two images and find the differences between them, thefaster you find the differences, the better, because your time islimited.Find the differences in the images and have fun with thisset of 7 errors. Enjoy amazing pictures while you find the differences between them.Improve your observation skills and train your brain playing Findthe Differences 500 levels! This free puzzle game won’t let youstop playing! Are you ready for the challenge? • 500 levels to findthe differences! • ZOOM for the pictures! • No time limit! • Alllevels unlocked • Endless hints to help you out • HD pictures forphones and tablets Find the Differences 500 levels is a free puzzlegame known as “Find differences”, “Spot the difference” or “Findthe differences” where you look for differences between twopictures. If you enjoy playing games like Hidden Objects thispuzzle game is perfect for you! "Spot it" is a simple pattern recognition game. 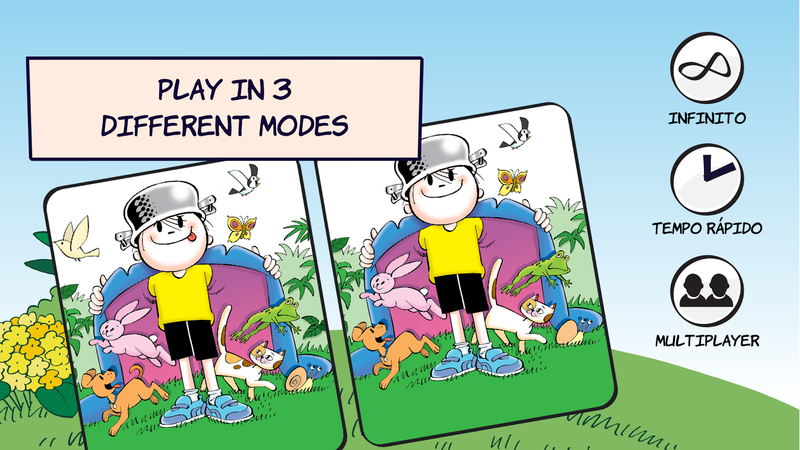 It is a type ofpuzzle where kids must find 5 differences between two otherwisesimilar images! • Award-winning game of visual perception for thewhole family. • Develops focus, visual perception skills, and finemotor skills. • This photo hunt game is toddler tested * Beautifulpictures * Addictive game play that is fun for everyone! Now let'splay this new game! Enjoy amazing pictures while you find the differences between them.Improve your observation skills and train your brain playing Findthe Differences 300 levels!This free puzzle game won’t let you stopplaying! Are you ready for the challenge? • 300 levels to find thedifferences!• ZOOM for the pictures!• No time limit!• All levelsunlocked• Endless hints to help you out• HD pictures for phones andtabletsFind the Differences 300 levels is a free puzzle game knownas “Find differences”, “Spot the difference” or “Find thedifferences” where you look for differences between two pictures.If you enjoy playing games like Hidden Objects this puzzle game isperfect for you! Find Differences 150 levels is a classic and favorite puzzle gameof million peoples around the world. Description: 1) 150 levels 2)No time limit! 3) At each level you can use 2 hints! 4) To play inthe horizontal and vertical position of the screen. 5) For smallscreens or not very acute vision - zoom function will help you. 6)High Quality pictures! 7) Designed for phones and tablets! 8)Simple and intuitive interface. This is puzzle game known as “Findthe difference”, “Difference game”, or “Spot the difference” whereyou have to find ten differences between 2 pictures. If you getstuck, there is two hints to help you! You gonna love this game ifyou like games like find the difference and hidden objects series. To collect puzzles - very popular entertainment, both among adults,and among children. Features of a game: • Adult puzzles; • 10various categories of pictures; • Puzzles consist of 56 and 100details; • An opportunity to keep not up to the end collectedpicture; • Having pressed the button, it is possible to look at thepicture which needs to be collected; • Pleasant music; • Puzzlesfor adults without the Internet. Probably, there is no such personwho does not like to put puzzles. It and is not strange. Puzzles -the cleverest games in the world, a riddle, an intrigue whichsurely wants to be solved. And still it is useful to slazhivatpuzzles, and not only to children, but also adults. Puzzles foradults - a game which not only adults, but also children can play.A game puzzles consists of 10 different categories of pictures -animals, mountains, food, flowers, birds, falls, architecture,transport and the sea. Each category contains 8 pictures on thecorresponding subject. If during collecting of a puzzle there aredifficulties, it is possible, having pressed the button, to look atthe initial picture. Puzzle fine entertainment which does the childmore assidious and reserved trains small motility of hands andimproves the imagination. And for adults it is extremely powerfulanti-stress and pleasant pastime. And the most important thatpuzzles a mosaic can be collected by all family or with friends.And as is well-known common interests very much pull together.